Regret we do NOT ship to PO Boxes. Shipping is $3.00 per item for anywhere in USA by standard mail. Merchandise is only returnable unused, in original condition, with tags still attached, and within 3 days of receipt of merchandise. Please contact seller with further instructions. Thank you. 247SaleStore, an online store with new product lines which are continuously added as we continue to provide you with the perfect online shopping experience. We are commited to offering you the best experience online and first-rate services. 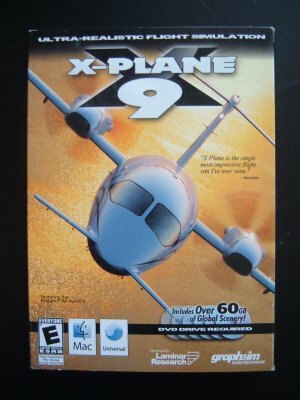 X-Plane 9 is the most comprehensive and powerful flight simulator available for the personal computer. X-Plane 9 simulates anything that flies: from single-engine fixed-wing props to multi-engine jets; gliders to dirigibles; helicopters to spacecraft to VTOLs, X-Plane 9 simulates them all. Using blade-element theory, X-Plane 9 accurately simulates the aerodynamic properties of any lifting surface, producing the most realistic flight dynamics available.